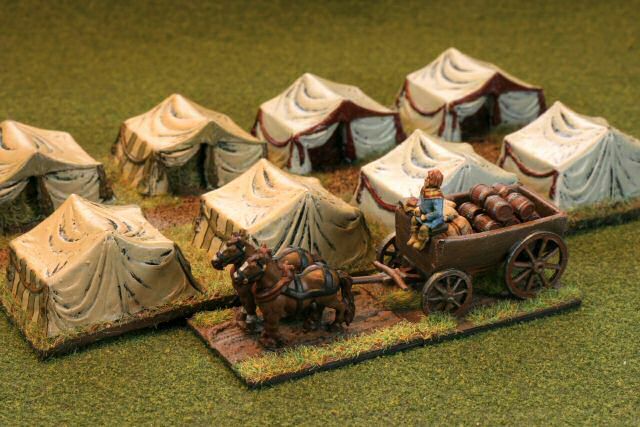 This article shows various camps, baggage handlers, and camp followers in 15 mm scalefor the historical miniature war game De Bellis Antiquitatis . In the game, each side that does not have a built-up-area (BUA) or war wagon should have a camp.The camp may be defended by a garrison of warriors or by a free optional set of camp followers.Should the camp be attacked, the garrison or followers will defend the camp.If the camp should fall, the garrison is eliminated and the camp counts as 2 elements lost. 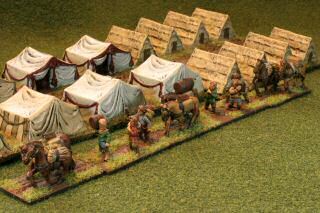 In DBA 2.0, the size of a camp is limited to a rectangle whose length plus width is less than 6 base widths wide.For a standard 15 mm game, a base width is 40 mm, so the largest area camp would be 120 mm by 120 mm.In DBA 2.1, the size was adjusted to length plus width less than 4 base widths or a maximum area of 80 mm by 80 mm.In the photo to the right, the center camp is 100 mm by 100 mm, and the two side camps are 80 mm by 80 mm. 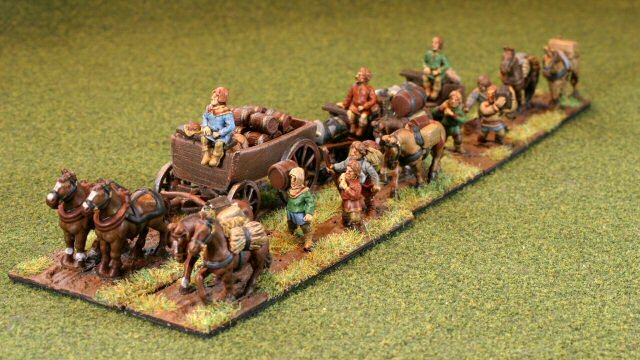 All the figures in this article are from Essex.They have a nice variety of wagons, porters, beasts of burden,carts and such.To the right is what I call the beer wagon. It is a large four wheel cartwith two heavy horses.I loaded it up with some bags from Essex and some barrels from a N scale train model.Since the cart is so large, it sits on two 40 mm by 25 mm thin plywood basesfrom Litko. The tents are resin models from Baueda.They have tents and forts of many cultures and time frames.The A-frame tents are the simple peasant huts which work well foralmost any battle up to the 18th century.The larger tents are considered Greek tents, but based on how they arepainted, I think they do well for many cultures.I will certainly be building and painting more Baueda models in the future. To the right are 6 pack horses and 6 stout porters.They all carry an assortment of barrels, sacks, boxes,and various fodder.I put two horses or three porters to each 40 mm by 20 mm base. The base is made with textured spackle and some static grass.The figures as coated with matte varnish from Krylon. To the right, two ox carts head through the middle of camp.I recommend that you use plywood or non-wood basing materialfor camps.I had much difficulty with the bass wood base warping from themoisture of the spackle and the glue.Plywood or linoleum tile or metal would have avoided warping.I had to use more water and some heavy weights to reverse theeffect of warping. Well it is written in the village rolls,that if a plow team wants an oxen,and that oxen is lent,then the villiens and the plowmengot to have the Lord's consent. Some of the main points covered in this talk are now availableon a long-playing record entitled "The Ronettes Sing Medieval Agrarian History." 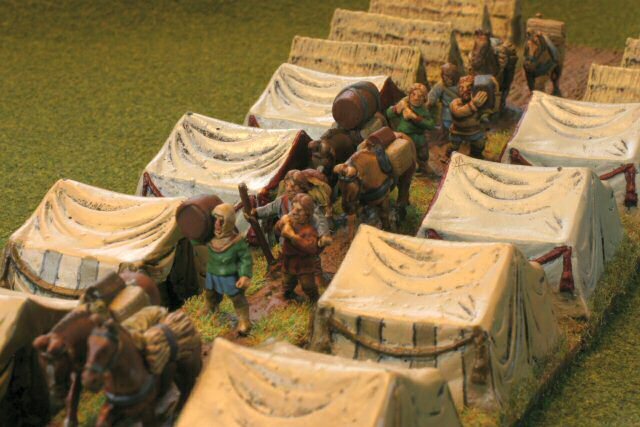 Of course, you only need one base of camp followers to play DBA,so why did I make eight?Well, I like to play miniature games with lots of good lookingfigures and lots of eye candy.Any battle looks more realistic with lots of tents and lots ofinnocent baggage handlers helping provide the comestibles. 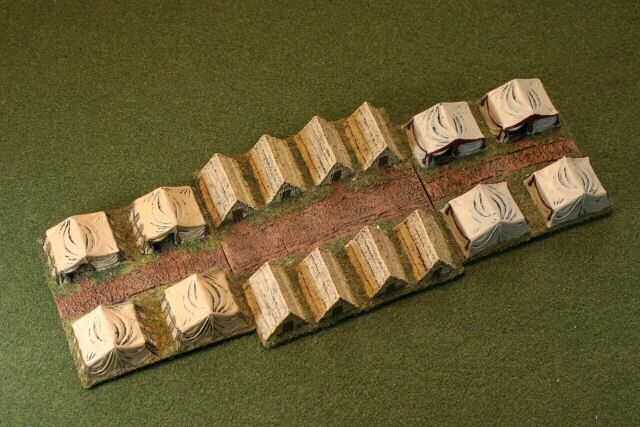 Additionally, one can make some battle scenarios that requirean attack on a baggage train or safely escorting a trainfrom one side of the board to the other. 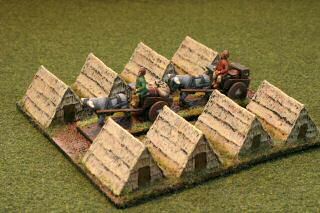 If you like miniatures, modelling, and historicalbattles, you might like Dan Becker's Miniatures Site. Last modified: Thursday, 09-Jun-2011 12:41:38 MST.